It seems Russian spirits weren’t broken by last year’s Phobos-Grunt launch fiasco and less then a year after the botch it was confirmed that a Phobos-Grunt 2 mission might take place in 2020 or 2021. Speaking during the “Days of Science” dedicated to the 55th anniversary of Sputnik, Lev Zeleny, the director of the Space Research Institute of the Russian Academy of Sciences, said that the institution approved of the plans to fly Phobos-Grunt 2 at the beginning of the next decade. Phobos-Grunt seen here before its launch in November 2011 (Credits: Roscosmos). Ever since the failure, Russian scientists have been continually expressing their desire to try the project again. It wasn’t clear though, whether the decision makers within Roscosmos would support the idea, especially as Russia agreed to collaborate with the European Space Agency on the ExoMars project which was given a priority. Earlier this year, Roscosmos’ chief Vladimir Popovkin requested that the Space Council of the Russian Academy of Sciences evaluate the scientific value of a possible Phobos-Grunt 2 in case it flies no earlier than 2020. Phobos-Grunt was supposed to return a sample from the Martian moon Phobos and thus test the technology for a possible sample return from Mars itself. But by the time a 2020 launch takes place, it is expected that other missions will have successfully carried out sample return from other bodies. For example by 2016, NASA’s foreseen OSIRIS-Rex mission should have been launched and will have returned a sample from an asteroid to Earth by 2023. The structure of the original Phobos Grunt spacecraft (Credits: Roscosmos). Obviously, Russian engineers weren’t keen on seeing all the effort of ten years of preparations go to waste and are adamant Phobos Grunt 2 can still bring value. Of course, that can only happen if the “lessons learned” from the first time around are properly implemented. So what might change in the second generation Phobos-Grunt? The priority is to re-design the flight control system which was responsible for last year’s fiasco. It is believed that the highly reliable Fregat upper stage will regain its initially intended function of navigating the spacecraft from Earth’s orbit to Mars. In the case of the first Phobos-Grunt, engineers decided to transfer this function to a newly developed onboard computer. Some of the scientific instruments of the first probe won’t be present on the second one, as many of them are now supposed to be placed on the Euro-Russian ExoMars spacecraft. 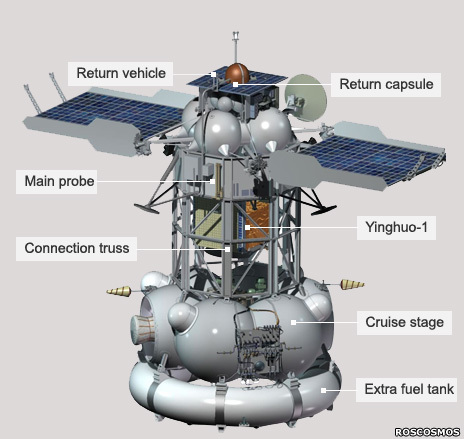 Also missing will be the Chinese satellite that unsuccessfully tried to hitch a ride to Mars with Phobos-Grunt 1. The pre-2020 missions Luna-Reusrs and Luna-Glob, expected to fly in 2016 and 2017, offer the opportunity to test some of the remaining instruments and technologies. The Mars bound Phobos –Grunt was left stranded in low Earth orbit on November 9, 2011, soon after its launch. The cause of the failure was later identified as a programming error in an onboard computer.